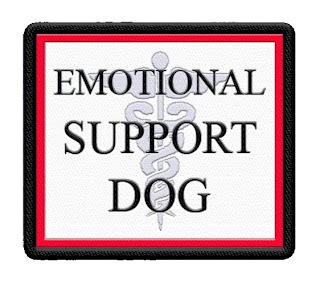 We have been asked to carry Emotional Support Dog patches. We thought it would be a good idea to define what a Emotional Support Animal is since we are often asked. An emotional support animal (ESA) is a US legal term for a pet which provides therapeutic benefit to its owner through companionship and affection. Emotional support animals are not specially trained to mitigate a disability. They require only as much training as an ordinary pet requires in order to live peacefully among humans without being a nuisance or a danger to others. However, their owners are afforded privileges through a Federal grant which allows them to keep the dog in most types of housing, even when there is a "no pets" policy. The Air Carrier Access Act provides policies that permit a person with a disability to travel with a prescribed emotional support animal so long as they have appropriate documentation and the animal is not a danger to or interferes with others.